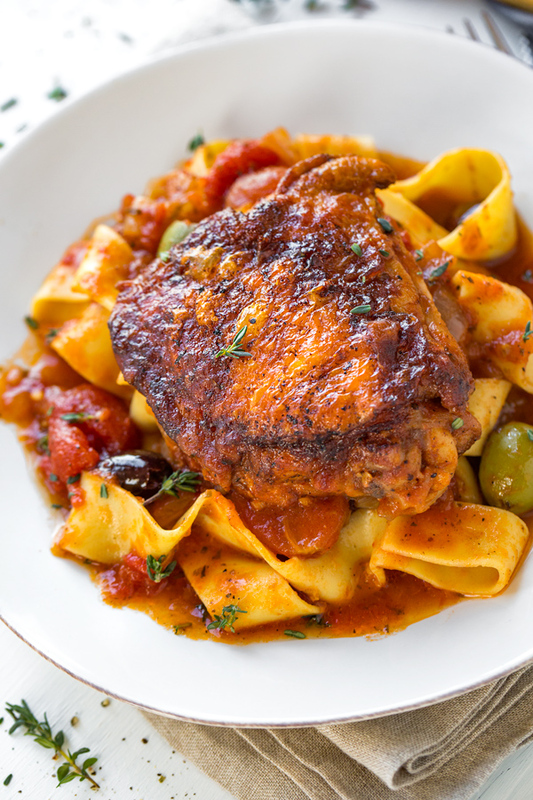 For me, a simple recipe for braised chicken thighs with tomatoes and olives is utterly replete with love—infused with care, comfort, and coziness, with juiciness and sauciness, and it never fails to pique my appetite and to playfully entice me. There are certain types of dishes that I prepare, certain types of recipes, that really excite me without fail. They’re always dishes that are rustic, often with a rich sauce simmered with a generous array of aromatic and wonderfully earthy ingredients such as onions, garlic, herbs, olive oil, tomatoes, wine, olives…my list, indeed, could go on and on—these dishes always sound good. A meal like this reminds me of a “farmers meal”, something one would joyfully, eagerly, hungrily tuck into after a long days work outdoors, using fresh chicken from one’s own henhouse, along with fresh ingredients cultivated from one’s own garden. Have I ever mentioned that I have a rich imagination? 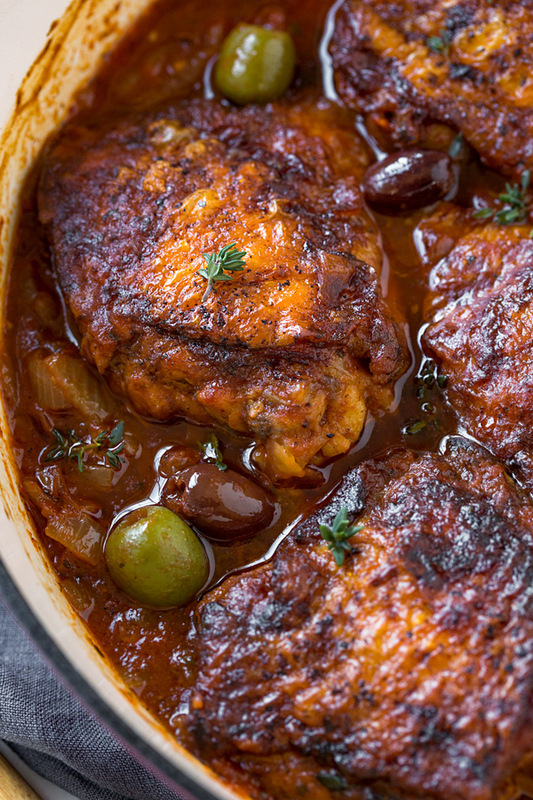 Actually, these braised chicken thighs remind of something my own great grandparents might have prepared—they were European farmers. They had free-running chickens of their own that they raised, along with a vibrant garden they tended to and toiled in over many years that yielded big, beautiful love-infused produce that was always used so liberally in the meals that they created and enjoyed. And I must confess, this is something that I deeply appreciate about food, and about the art of cooking. Braising is one of my favorite methods of cooking. There’s something that I love about it, and perhaps the answer lies in the rhythm of those initial simple steps that a good braise requires. After that, all that a braise needs is to be left alone for a while to work its magic. It is essential to have a proper braising pan, one that is heavy and that conducts heat well. A cast-iron skillet or heavy-bottom enameled pan is best to use, as one can brown and sear a protein such a chicken quite beautifully in such a pan, which is the first step in this braised chicken thigh recipe. Oil is added to the pan, and allowed to become almost “smoking hot” before the chicken is added in, skin-side down, and allowed to crisp and become golden for a few minutes, then flipped over and allowed to sear on the bone-side. Once golden on both sides, the chicken is removed and set aside so that the other ingredients—those aromatics such as onions and garlic—can have their time in the pan, followed by adding in any spices. Then the liquids such as wine, stock, tomatoes (in this case) are added to form that wonderful, flavorful braising liquid. 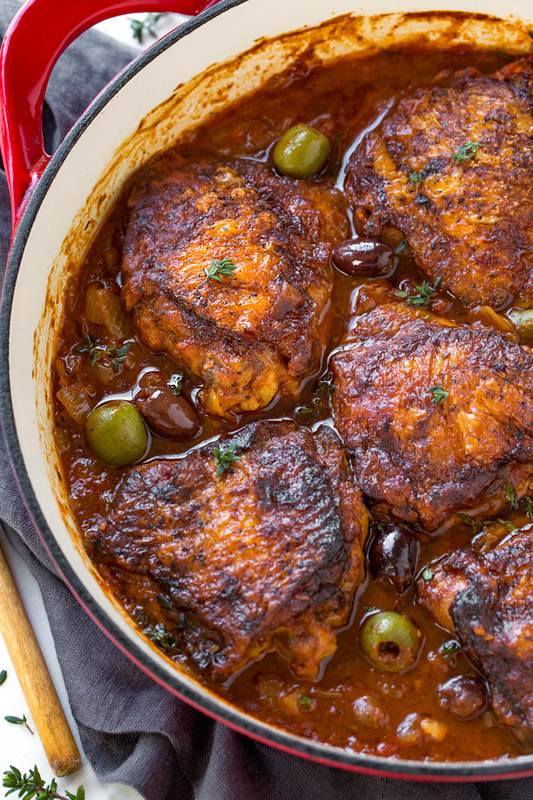 Once the olives are added, I return the seared chicken back to the pan; then the whole thing is brought to a gentle simmer, and placed into the oven to finish, gently cooking to succulent perfection. What arrives out of the oven roughly forty five minutes later is savory, rich bliss, or love in food form. Give your thighs a pat down: Keep the chicken thighs as dry as possible so that when you place them into your hot pan, they will become nice and browned, and crisp. Use a cast-iron or other heavy-bottom pan: This is a job for your cast-iron pan, or other heavy-bottom, oven-safe pan—it will become nice and hot, and sear the skin on the thighs. Leave out the wine: There’s a small amount of white wine in the recipe, but feel free to leave it out—you can substitute a bit more chicken stock, instead. Serve with your favorite side: I love to serve this dish with pappardelle pasta; but rice, gnocchi, or even potatoes are wonderful options as well—even just some rustic bread on the side makes for a perfect companion to this dish! 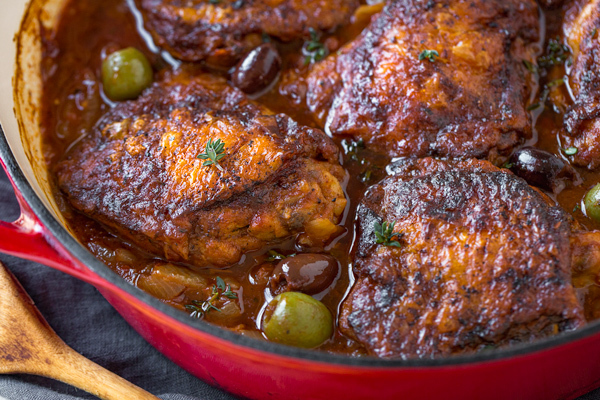 Rustic and saucy, this rich and flavorful braised chicken with tomatoes and olives, plus a tiny hint of white wine, is a simple peasant-style meal finished in the oven to juicy perfection, served with your favorite side. -Add your chicken thighs to a plate or bowl, and pat them dry with paper towel; drizzle over about 1 tablespoon of olive oil, plus a couple of pinches or salt and pepper, the paprika, and the granulated onion. -Place your cast-iron pan or heavy-bottom skillet over medium-high heat, and drizzle in about 2 tablespoons of olive oil; once the pan is very hot, add the thighs in, skin-side down, and allow them to sear for about 6-7 minutes on that first side, until deep, golden-brown; flip, and sear for another 4-5 minutes; remove from skillet, and set aside for a moment. -To that same skillet add the sliced onions, and allow them to saute and become golden-brown; next, stir in the garlic and the Italian seasoning, and once aromatic, add in the tomato paste and cook for about 30 seconds to cook out the raw flavor. -Add in the wine (if using) and allow it reduce completely; next, add in chicken stock, along with the chopped tomatoes with juice, and the olives, and stir to combine; nestle the thighs back into the sauce, skin side up, and place into the oven to braise for 45 minutes (uncovered) until the chicken is cooked through and the skin is extra crispy and a deep brown. -Finish with a sprinkle of fresh thyme leaves or parsley, and serve with an accompaniment to soak up the sauce. My hubby and I really enjoyed this dish. We also soaked up the extra sauce with slices of rustic wbole garlic clove bread. Really flavorful and a nice complement to the chicken thighs. Will definitely make this again! Joyce, the fresh tomatoes and herbs from your own garden sound absolutely scrumptious—I’m sure they infused the dish with lots of wonderful flavor and aroma, and I can only imagine how tasty the end result was! Thanks so much for sharing your experience with me, and I’m thrilled this recipe will be your go-to for braised chicken!